Our morning commute from Bozeman to Big Sky Resort followed the Gallatin River for the majority of the 50-mile drive, winding through a scenic canyon lined with the occasional cabin or ranch. Within a few miles of the resort, Lone Peak (Big Sky’s 11,166-foot summit) emerged from the landscape in unceremonious fashion. Even from our distant vantage, it was easy to see why Big Sky claimed “The Biggest Skiing in America,” bragging rights that aren't about skiable acres. Once on the mountain, we jettisoned up the Lone Peak Triple lift and took a few warm-up laps down The Bowl, an open pitch conducive to big sweeping turns. When I say sweeping, I mean it—Big Sky offers about 2 acres per skier and some of the shortest lift lines around. We spent the remainder of the morning navigating as much of the 5,800 seamless skiable acres as possible, moving north to south from the Madison Base Area to Moonlight Basin and eventually stopping for lunch at Everett’s 8800 on top of Andesite Mountain. It’s probably worth noting that we struck up enough courage to board the 15-passenger Lone Peak Tram for a stomach-churning ride to the top of Lone Mountain. During the 1995-1996 season the Lone Peak Tram was installed, expanding the resort’s overall size by nearly 50 percent. The two cabins move in alternating directions and travel a breathtaking 1,450 vertical feet over a distance of 2,828 feet. 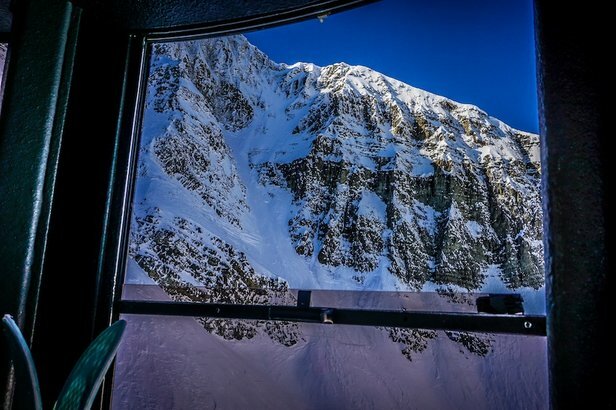 Big Couloir, Big Sky’s signature line, tumbles 1,200 vertical feet on a 50-degree pitch directly beneath the tram. To ski the line, it's no secret that all skiers must sign-in at the patrol shack before attempting the bucket-list pitch. Unfortunately, Big Couloir was closed on our ski day, so we opted for a southerly facing line known as Marx. A bit of rock hopping through the Yeti Traverse put us at the top of this demanding double black, which ended up claiming our agreed upon “favorite run of the day” during the ensuing après. 1. Swift Current Terrain Park: Summer work has increased the Swift Current Terrain Park in size by 25 percent, improving the jump line with new and enhanced features. 2. The Cache: Enjoy brand new small- to medium-sized features in the Moonlight Area with Big Sky’s new stash park, The Cache. 3. Glades: Two new intermediate and one beginner glade run have been opened, offering close to 10 acres of additional skiing. Big Sky’s new Fecon mower has aided in this expansion, making quick work of pesky deadfall and stumps. Everett’s 8800: Make sure to make a reservation, as Everett’s isn’t your average cafeteria-style mountain lodge. Enjoy endless views of Lone Peak from the luxury dining area and wrap-around deck while enjoying American alpine fare. When it comes to liquids, solids and live music, there’s the right way, the wrong way and the Bozeman way.